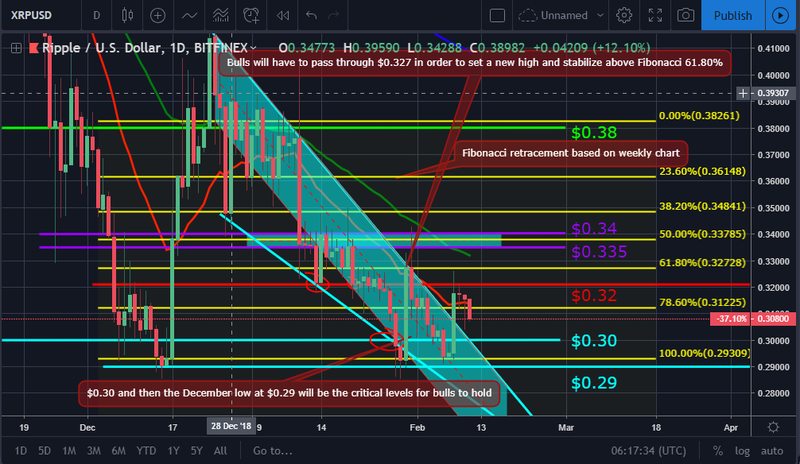 The XRP token sits at $0.308 at the time of writing on February 11, 2019, two percent lower since yesterday, but still well above the $0.30 support line and December 2018 low of $0.29. The total crypto market cap is up by $9.5 billion since February 8, now at $121 billion as the top ten cryptocurrencies are all in the green for the same time period. Bitcoin gained more than five percent while ether rose by 12 percent. The Ripple company token closed the session on February 7 at $0.295 after trading in the $0.293 to $0299 zone during the day. The XRP/USD pair gained 7.4 percent of value on February 8 and stormed past the $0.30 resistance line to peak at $0.326. It closed the workweek at $0.317 without meeting new highs on the daily chart, still setting the ground for further upwards moves. It was expected to see a short downward correction in the form of profit taking in the days following the mentioned price increase, so the XRP dropped to $0.315 during the weekend of February 9 to 10. On February 10, it almost broke below the $0.30 support, but buyers held their ground rebounding from $0.303 back to $0.315. One of the most popular cryptocurrencies was 3.2 percent up for the seven-day period. The Ripple token is hovering around $0.308 in the early hours of February 11, starting the new week with a drop of more than two percent. The target for buyers will be to hold $0.30 and initiate a short-term bull run towards $0.32 and $0.3276 (in an effort to make a new high and stabilize above the 61.80 percent Fibonacci level, which coincides with that level). Sellers will be looking to push below $0.30 and December 2018 low of $0.29. xRapid is Ripple’s liquidity solution product for financial institutions that uses XRP as a bridge currency between less-known fiat pairs. Binance’s recent activities include adding credit/debit card payment options and launching a brand new GBP trading platform on the island of Jersey. A new group of 11 top-tier universities and colleges is joining Ripple’s University Blockchain Research Initiative (UBRI) program. As announced on February 7, 2019, the San Francisco-based company will collaborate with higher education partners from the United States, Singapore, China and Brazil to support blockchain development, academic research and cryptocurrency studies. On January 24, Ripple announced their “blockchain technology research scholarship program” with the Institute for Fintech Research at Beijing’s Tsinghua University as BTCManager reported. Back in June 2018, the U.S.-based startup launched its Blockchain Research Initiative to support innovation in blockchain technology, cryptocurrencies, and digital payments.